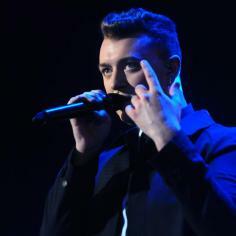 Sam Smith brought the house down at an MTV Brand New showcase last night (30.01.14). The BRITs Critics' Choice winner, who has been added to the list of MTV nominees for 2014, took to the stage with a full band at London's Islington Assembly Hall. The gig was one of two showcases, presented by Emporio Armani Diamonds, after Ella Eyre, Katy B and George Ezra took to the stage the previous night. Opening act Kwabs stunned the audience with his soulful voice, mixing his African roots with R 'n' B and gospel influences, before rising star Joel Compass debuted material from his EP 'Astronaut'. The crowd were eager to see 21-year-old singer Sam, who didn't disappoint, performing hits including 'Latch' and a stripped-back version of number one single 'La La La', his collaboration with Naughty Boy. But the stand-out song of the night was Sam's emotionally-charged ballad 'Lay Me Down', which was followed by the addictive new single 'Money On My Mind'. Voting for MTV Brand New 2014 closes today (31.01.14) and the winner will be announced on February 3.